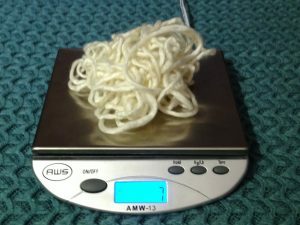 Two weeks ago I talked about a very simple method to calculate a mystery yarn’s weight. And I promised I would soon be back with a tutorial on how to determine yardage. Well here I am. 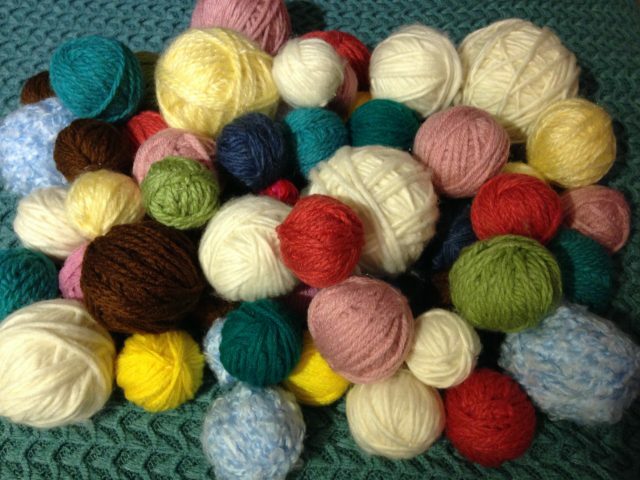 If you’re like me, you have bags full of yarn inherited from friends, family, yard sales and frogged projects. And you have no clue how much you got of each. (Which can be a pain because, as you know, most patterns call for a specific yardage.) Well, this is about to change! 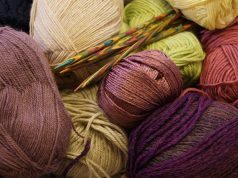 Here’s how to determine yarn length from weight. 1. 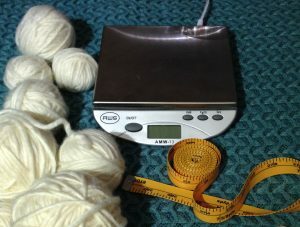 Using your measuring tape, measure a bit of your mystery yarn. 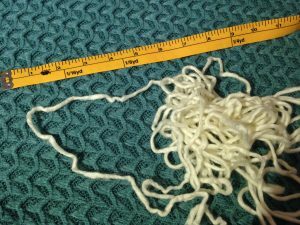 I measured a small ball of this soft, gorgeous cream yarn and got 8.75 meters. 2. Weigh this portion using your digital scale. I got 7 grams. 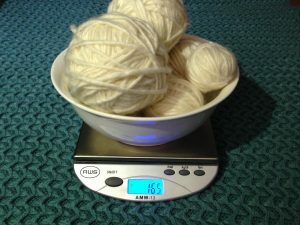 Then, you simply weigh all the yarn. 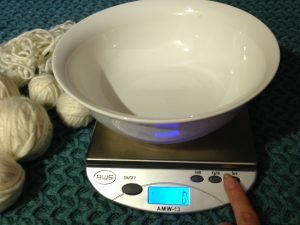 If you got multiples balls, here’s a clever trick to weigh it all at once: use a bowl or a box that you’ll put on your scale before you set it to 0 (Tare button). Once you’ve set your scale to 0, you can dump all the balls in the bowl/box and Tadaaaaam! You got your global weight: 165 grams. Now for the hard part… What am I gonna knit with those glorious 206 meters of fluffy cream? ?